The amount of money the federal government spends on the food stamp program has hit a seven-year low, according to the latest U.S. Department of Agriculture (USDA) data outlining the cost of the food stamp program. 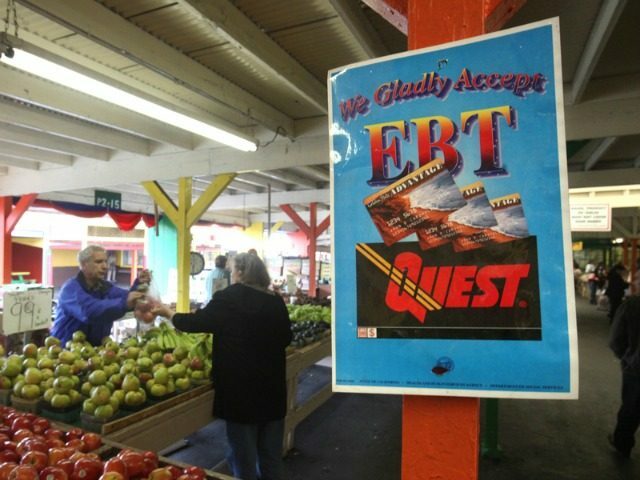 The U.S. government spent an estimated $68 billion on the food stamp program in fiscal year (FY) 2017, the lowest amount the government has spent on Supplemental Nutrition Assistance Program (SNAP)—the program that administers food stamps—since the year 2010 when the government funneled $68.2 billion towards the program. Government spending on the SNAP program peaked at an all-time high in 2013, when the federal government poured an estimated $79.8 billion into the program because the Obama administration allowed those with higher incomes to receive benefits. Enrollment in the government program swelled to 47.6 million in 2013—its highest level since former President Lyndon Johnson began the food stamp program in 1964. As more people enrolled in SNAP, the government spent more money on the program to keep up with the influx of people receiving benefits. Although both spending and enrollment reached its peak in 2013, the massive increase in federal government spending on the program began in 2009—the first year of Barack Obama’s presidency, according to USDA data. In 2008, the last year of former President George W. Bush’s term, the federal government spent $37.6 billion on the food stamp program. A year later, after Obama’s first year in office, the government poured $53.6 billion into the program. The estimated $16 billion spike in government spending on food stamps between 2008 and 2009 is the largest increase in the history of the food stamp program. The second largest increase in government spending on food stamps took place the following year, when the U.S. government poured an additional $15 billion into the program. While the amount of government money spent on SNAP has decreased, spending has not gone down to its pre-recession levels. Government spending on SNAP only decreased by $2 billion over the past year from 2016 when the government spent $70 billion on the program. President Trump said he would make it a priority in his administration to get able-bodied adults back to work and off welfare at the federal level when he announced his 2018 budget, and his administration announced several new initiatives aimed at driving SNAP program costs down this month. The USDA announced this month that they would give state agencies more control over administering SNAP and that they are testing a program in Arizona aimed at reducing instances of food stamp fraud. “We want to make sure that people are getting the nutrition they need, but we also must maintain the integrity of the SNAP program for the benefit of recipients and for the protection of the taxpayers,” Secretary of Agriculture Sonny Perdue said in a statement Friday.